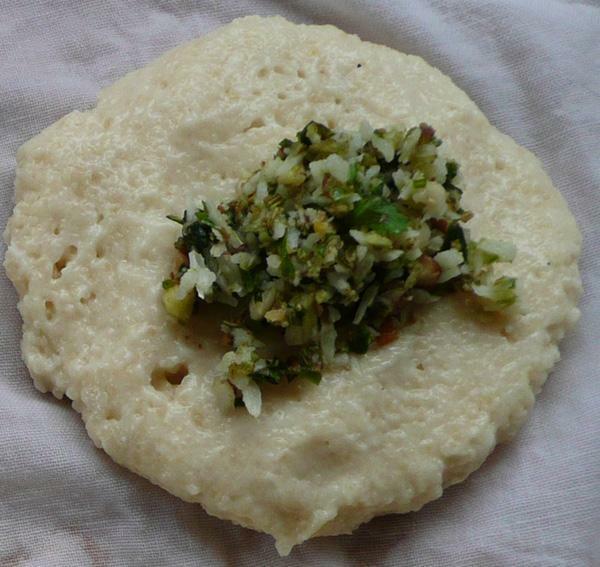 Dahi Vadae/Bhalle (Singular Vada or Bhalla) are another one of a group of snacks called 'Chat'. They are served dipped in spiced yoghurt, with Green Mango Chutney and Imli Chutney on the side. You can make them plain or with a stuffing. 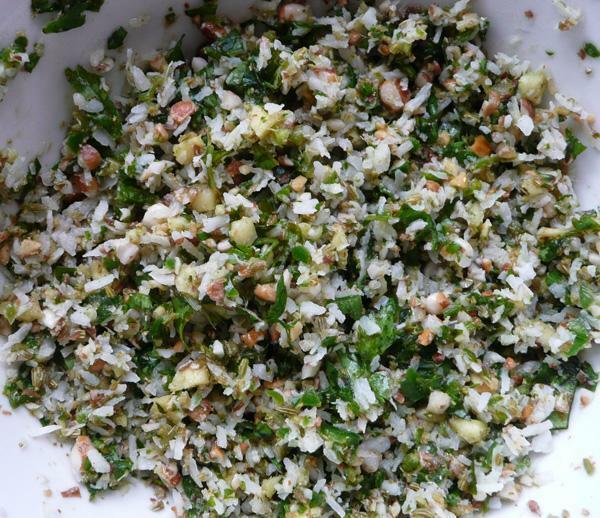 You can also add the stuffing ingredients to the ground dal mix, if you donâ€™t need to fiddle around with the stuffing. A ready made dal Vada mix of any good brand, available at most Indian grocers can replace ingredients marked *, and ensure success as well as saving time. If using ready mix, follow instructions on the packet. Makes about 20- exact number will vary depending upon the size you make. A handkerchief size muslin cloth or a thin plastic sheet. Soak both dals overnight or for 5-6 hours, mixed with enough water to cover. Grind dals together in a coffee grinder to a coarse, semolina like consistency. The consistency needs to be like a very soft dough, not batter, so do not add too much water at the beginning. You can always add more, if too stiff. Start heating the oil in a wok or karahi. On a smooth work surface, spread wetted muslin (old handkerchief) or a sheet of plastic sandwich bag, split open on two sides. Place small portions, approximately 1 heaped tbs., of the vada mix on the cloth/plastic. With wetted fingers, spread each blob gently into a flat circle, like a thick (1/2cm approx.) biscuit or a small burger. Place 1-1 1/2 tsp. filling in the centre and roll up edges. Flatten to a burger shape again. You can leave it like this or make a hole in the centre, as in picture. Hole stops them from ballooning. 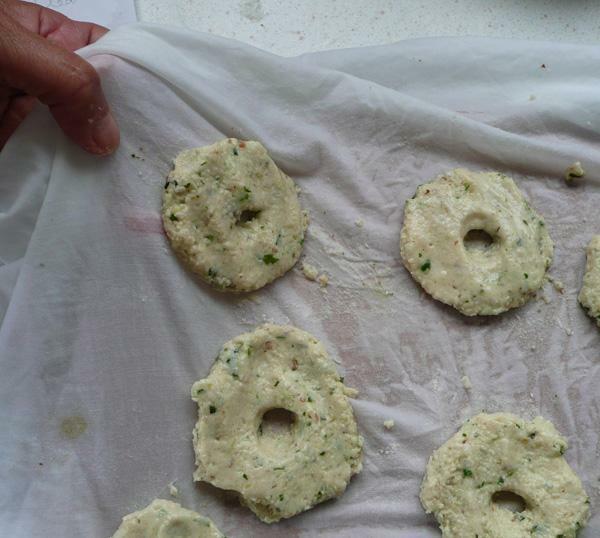 Once you have made 5-6 vadas this way, gently lift one edge of the muslin or plastic from the work surface, using your left hand. Peel/ease off one vada at a time with your right hand. Gently slide it into hot oil from the side of the wok. Fry in a group of 4-6, on medium heat, until light golden brown. Do not have the oil too hot, otherwise vadas will remain uncooked in the centre. You can add all the stuffing ingredients to the ground dals at step 2 and then follow steps 5, 7, 8 & 9. Mix yoghurt and spices in a bowl and beat lightly to a smooth, batter like consistency. Keep aside. Soak 1-2 vadas per person in warm, salted water for 5-10 minutes. 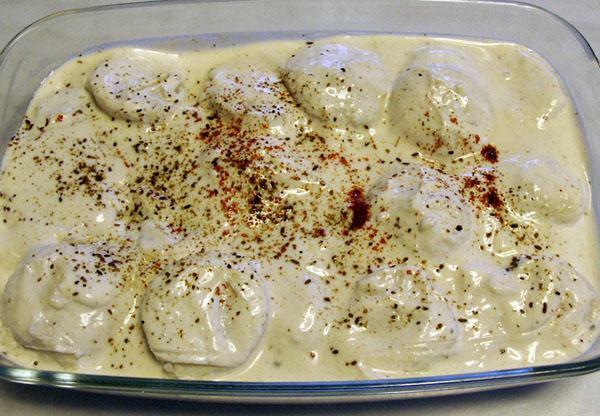 Lift each vada out of the water, press lightly between two palms to squeeze out the water, dip in yoghurt sauce, and arrange on the platter, NOT overlapping. Overlapping them will make them break during serving. Spread some more yoghurt on top of the vadas, to cover them properly. Just before serving, spread some more yoghurt on top of Vadas, decorate with a sprinkle of roast cumin powder and chilli powder. Serve chilled, with Tamarind Chutney and Green Mango Chutney. Vadas can also be served hot as a snack, at step 9, without dipping in the yoghurt sauce, with Coconut Chutney 1, Coconut Chutney 2 or Green Mango Chutney. 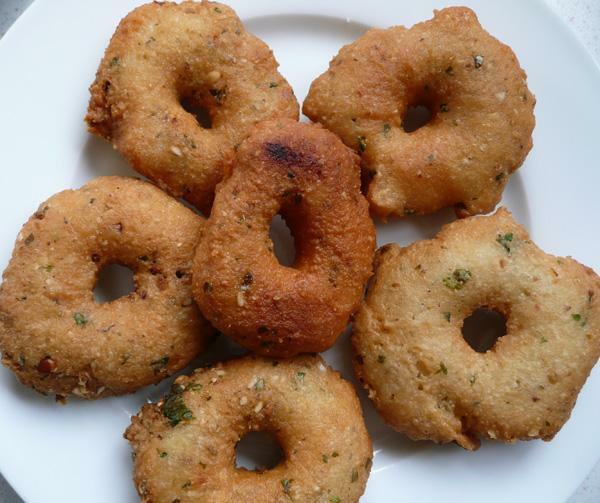 You can make vadas in a microwave, without the need to fry them. Add 1 teaspoon oil to the vada batter. This is essential to allow heat to tavele through the vada. Now, make them as in step 7 above and place 6-8 at a time on a microwave plate. Microwave on full for 3-4 minutes. 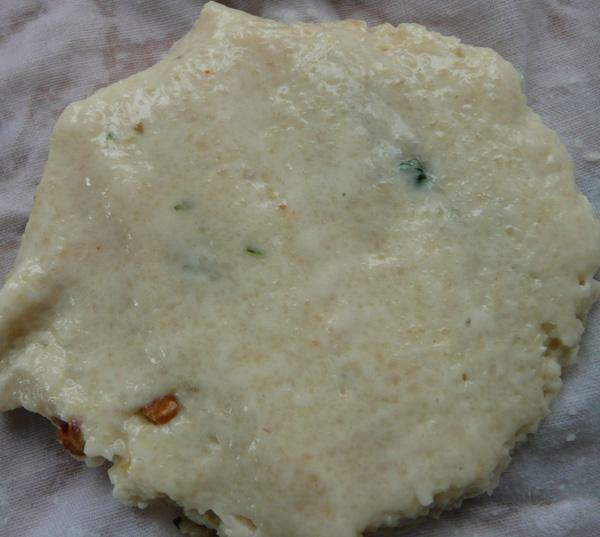 They cook very nicely in any microwave steamer, like an Idli steamer. The best tasting ones however are the deep fried ones.